The mighty Cheat River in Albright, West Virginia boasts an ever-changing flow, making each experience on this river unique. From April through June, you can run the largest free-flowing Class IV and V river in the East with one of our experienced guides in your raft coaching you all along the way. Put your skills to the test on Cheat Canyon as you travel through Big Nasty, High Falls and Coliseum rapids, experiencing this West Virginia classic. 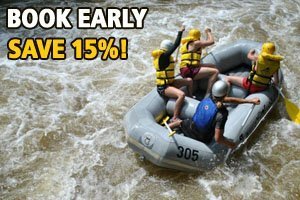 We will meet at our Outdoor Center in Ohiopyle, PA. From there we will transport you to the banks of the Cheat River in Albright, WV. All you need is a passion for the outdoors and a desire to enjoy one of the classic whitewater runs in the East. Shuttle transportation and a riverside deli-style lunch are included. Think spring and join us on the mighty Cheat! Please note that the listed prices are per person and do not include 6% sales tax. The tour is offered from April to June. The skill level of this tour is 3 on a scale of 1 to 4. You will experience Class IV and V rapids. 14 is the minimum age of rafters on this tour. Estimated rafting time is 3 to 6 hours. This varies, so please don’t hold us to it.